The Joomla multi-lingual extension - JA Multilingual, striving to minimize the translating pain that you guys are having in just a simple 5 steps. Step 1Install the JA Multilingual extension & update Bing API. Step 5 Enable & config System Language Filter plugin. And tah-da, you’re now all set to go with the multilingual site. T3 Blank or JA Muzic. If you would like to play around a bit in the back-end, dive in this T3 Blank Backend Demo we've done for JA Multilingual extension. Though Joomla 3.2 does offer to help you set up your site with multi language, it only provides supports at the installation phase. Unlike our JA Language module, you can also use it while developing your Joomla site. If you would like to go even deeper with the steps, you can check out our JA Multilingual Documentation for more info. JA Multilingual Component takes advantage of Bing API - the free translate service from Windows Azure Marketplace. In case you haven't owned one yet, you can always grab one for FREE with up to 2M translated characters free per month. You can set or change your default language anytime you want. The JA Multilingual will take the default language as a profound language to based of and translate from there. Instead of installing languages one by one, JA Multilingual component lets you install them in one batch. 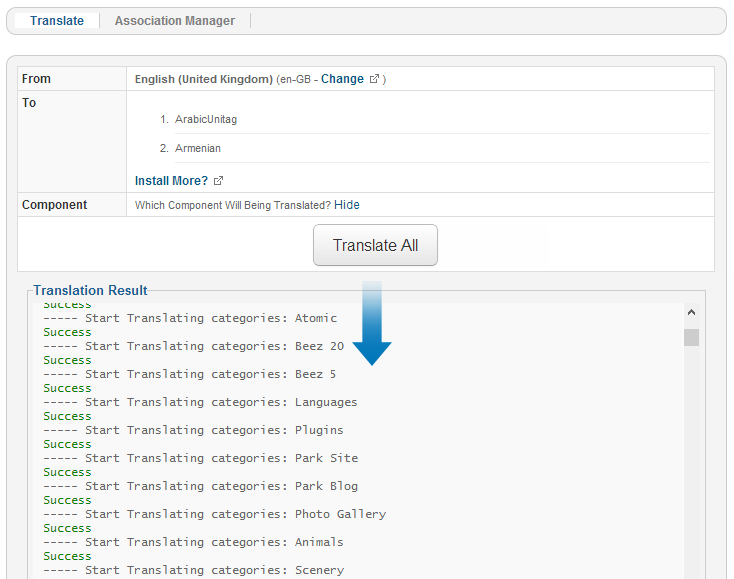 The translation process is much easier as the component allows you to translate to all different languages in one go. It's quick, it's easy and no complication. Once you got all your content translated, each translated item got its association listed under Association Manger. You can quickly filter out the content type you wish to edit and make changes. You can always come back and translate anytime for new contents only. It won't translate the same content twice. No duplication will be whatsoever. Sounds great, but where can I get my JA Multilingual? The extension is totally FREE, and you have to be a JoomlArt-er to grab it. If you already are, go ahead and download JA Multilingual extension below or find it under Free Stuffs in the Download section. Otherwise, you can also register for free.